God we loved this guy. The news came like an electroshock on that Thursday morning, now the Black Thursday on my diary. Like the eclipse of the sun, the day got suddenly dark and so did my heart and my mind. Denial was my first reaction. It could not be possible. Michael could not have left us. He would have sent a mail to tell me… Then the wave of tributes which flooded my mailbox made it clear it was not a nightmare. It was reality. And a strange thing happened. My mouse was frozen and so was my mind. I just could not write. Not a word. Deadlines were calling, emails piling up in box but the page stayed blank. Desperately blank. It was as if writing a tribute for Michael would be acknowledging what my heart refused to accept. But I had to go back into work routine and had to pump up the fuel for feeding the writing flow. Now I am ready to pay homage to “emdjay” (MJ) as we call him. My tribute will not scan his career nor the immense contribution he brought to the industry and all the whisky and beer lovers. That has been said with a lot of emotion by so many. I prefer to recall the fun memories. I first met Michael 9 or 10 years ago. I had been invited by William Grant to a cask selection. I felt so honoured to join the big boys in this trip. So thrilling for an obscure French journalist to be part of a cask selection with “the” whisky writer who had, as for all of us, been the catalyst of my malt fever. When I arrived in the airport lobby to join the band, Michael was reading his newspaper (he always carried 3 or 4 kg of dailies with him). He hardly raised his eyes above his tortoiseshell glasses, muttered a “nice to meet you”, then dived back into his reading. Classic star reaction, I thought. We had a dinner at the Craigellachie, I was sitting far from him, so we did not have any chance to talk. The following morning, the earlybird that I am met another one. Michael was sitting at the breakfast table, already dissecting his newspaper. But this time, he talked ! In fact, our first conversation was not focused on whisky but on rum. I had a sample of a French rum with me. In his inimitable “sponge” way, Michael absorbed information about this spirit new to him, bombarding me with questions and painstakingly noting the answers in his pad. So typical of Michael. I was astonished (and admiring) to see how meticulously he would listen to our guide and ask questions when we visited distilleries together – distilleries that he had been to so many times. He was always eager to grab something new to him, a detail that he had escaped him previously, whether it would come from a distillery manager, a worker or a whisky lover. He was interested in the dram but most of all in the life, behind and beyond. The essence of a true reporter. But also of a brilliant writer, as he could like no one sublimate the details he collected into gems, distilling a genuine literature. I will miss our verbal joustings when we would teach each other French, Norman, Yiddish or old English. I will miss his encouragements to experiment daring matchings, I will miss his enlightenment on literature, jazz music or even treize, his favourite game of rugby. And I will miss my partner-in-tasting, my brother in arms or should I say, my brother in drams. And a dear buddy. Truly missed but never forgotten. So, Michael, I’ll toast you with a dram we both enjoyed on Islay, on a sunny morning of may a few years ago. A Laphroaig 10 year old, a wee flask of which I had slipped into my rucksack as we decided to stroll the Big Strand. The roaring of the Atlantic, the marine-scented breeze, the peace and loneliness of the place and the happy burst of our laughter made it a very special dram that day. This is hard. Summing up the feelings at the loss of a friend because that, above all, was what Michael was. He was also my mentor, the first person to give me real encouragement in this game called whisky writing. He stood by me, he still hovers above me. I can hear that lugubrious Yorkshire voice in my ear as I write this, steering me away from the cliche, tutting if any maudlin sentimentality begins to intrude. As other have eloquently said, he started it all. He created the template, but he did so not because he saw whisky writing as a cold commercial opportunity (MJ and money never got on well together), but because he had a passion for this stuff called whisky. In any case, he wasn’t a whisky writer, he was a whisky journalist and in his ink-filled blood he knew there were stories here, endless stories about something he truly, deeply, loved. It’s only with this sudden, painful hindsight that I realise how his life was about celebrating the underdog: malt whisky when few drinkers had heard of it and fewer distillers were bothered about it; speciality beers when big brewers were flooding the world with fizzy pap; jazz as it became a minority music; rugby league. He was stubborn, he was generous, he was honest and open, he had no side to him, he had time endless time for others who shared his love of the malt and who wanted to know more. He had a wonderful twinkle in his eye for the ladies he liked. He was funny. “People think I’m miserable,” he said to me once. “I’m not, it’s just the accent.. and the face,” this said with the droll delivery of a true raconteur. I was proud to carry his books -- literally as I struggled through airports and Japanese stations with bags full of them and metaphorically as they are beside me, guiding me. When I was on my first trip to Islay in april 2000, I bought Michael Jackson's first whisky companion in the Old Kiln-shop at Ardbeg. For me, it was the opening of a new world, my first stepstone on the ladder of the World of Whisky. It was in those days my definite guide next to any whisky I tasted. Yesterday was our monthly whisky club meeting. 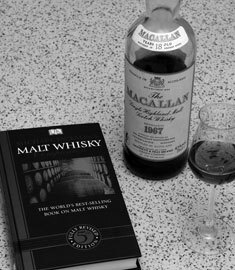 In the afternoon I had read some pages of Michael's WHISKY, at the meeting one of our members arrived with his copy of the COMPANION (as he does at every meeting) and by strange coincidence one of the two malts on the agenda was a Macallan 12yo. I only had the pleasure of meeting Michael twice…the first time was at Whisky Live New York for a few minutes in the spring of 2006. It was during that trip to New York that he appeared on Conan O'Brien's show…the one in which the world saw the extent of Michael’'s two-decade fight with Parkinson's Disease. A few months later, he told us about that battle in his columns for Whisky Magazine and Malt Advocate. Michael fought a brave fight against Parkinson's and his other health problems, and when we sat down for a brief interview this past spring, he looked much healthier and stronger than he had the previous year. When the red light on my Blackberry started flashing this morning, the last thing I expected to see was the news of his passing. Like many whisky lovers, Michael's writings helped me learn develop my passion. He had a knack for making the mysteries of whisky accessible to the common man, and a sense of humor that never failed to make me smile when reading his work. With the graying hair and beard, he reminded me of a wizard…with a twinkle in his eye and a way of working magic with his words. Michael's passing today is terribly sad, although not unexpected. That small quote stands witness to his generosity, his openness and preparedness to share knowledge. In the canon of whisky writing, he was a giant. His constantly up-dated 'Malt Whisky Companion' is the best guide to available expressions, and I have always found his tasting notes to be reliable (unlike another, more presumptuous writer, whose name I need not mention!). The first edition (1989) provides tasting notes for 234 malts (about a third of them from G&M!). In his introduction to 'Whisky: the Definitive World Guide' (2005), he remarks: "Distilleries that one bottled two or three expressions now offer 20 or 30. Macallan, at one stage had more than 100 expressions". QED. The truth is that he was very largely responsible for this - by opening the eyes of the consumer to the joys of malt whisky, and of the industry to the potential sales to be found out there. I first met Michael in Edinburgh's Bow Bar in 1987. I was negotiating the contract for my first book about whisky, and asked his advice about this. He was doing beer research (and I was happy to help him!). As always he was open, encouraging, helpful. 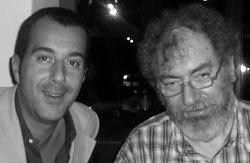 This was also my first exposure to his deep and entertaining fund of stories about whisky people, which was expanded upon with generosity and humour over the subsequent years, when we met at whisky events across the world. Dear Michael. I will miss him, as we all will. A hunched giant in our small world of whisky. My two greatest interests in life were set afire by you Michael. Michael was one of the gentlest and most generous whisky persons I ever met. The depth of his whisky wisdom and knowledge was un-phantomable. His willingness to share and masterly tutor his lifelong accumulated whisky insight was unparalleled. Many of us enthusiasts, traveling along various paths to the realm of whisky, used his fascinating books and articles as guiding lights. Beside whisky, kindness remained Michael’s religion. Although he was not one to attend synagogue regularly, he worshipped, as a fellow so well put it, honesty, honor, loyalty and integrity. Upon learning of his death I was entering a state described only as a permeate sadness. Sadness that still hangs, and that surely is shared by all those who knew and loved him. I am very sad that I never had the chance to meet Michael Jackson in real life... I knew him only from 2 of his Books ("The Malt Whisky Conpanion" and "Scotland and its Whiskies") and from many Videos. Michael, was for me the Spiritual Companion into the World of Single Malts, I remember my whisky beginnings, the many nights where I read his Whisky Companion, all that information and history about Malts and Distilleries. I have in my mind his words from one of his interviews : "when I am abroad, at the evening I will drink a whisky, probably a Single Malt and probably it will be one from Islay". That’ss is exactly what I will do tonight Michael, I will raise a glass of Caol Ila 36yo 1966 and drink this dram to your Memory. With Michael Jackson - although I have met him in person only once - I have spent quite some time of my life. His 'Complete Guide to Single Malt Scotch' was my first whisky book from which I learned a lot. It cleared the jungle for a beginner in whisky...this was the real Whisky Bible. In uncounted tasting sessions we dicussed his words and ratings, agreeing and disagreeing. I remember well, in 1998, two years after my first conscious sip of single malt, a good friend wanted to buy me a bottle of malt. He offerd me the Companion and let me choose a bottle mentioned in the guide, it turned to be a Springbank. The Companion was never returned for I spent hours and hours reading notes, staring at labels and ultimately wondering how it was possible that I never got a clue of that vast galaxy we know as Single Malt Whisky. Very sad news. I only met Michael once in Adelaide in 1993. I remember that he was totally gobsmacked that we smoked at whisky tastings. I guess he must have thought us colonials totally unsophisticated. Incidentally 1993 was the year I gave up smoking. Michael Jackson's Malt Whisky Companion (2nd Edition) was my very first whisky book and it became the subject of one of my very first e-conversations with Johannes - MJ's overrated and underrated whiskies. So Michael Jackson's scores became the currency of exchange and heralded my becoming a Malt Maniac. I for one am truly glad that he decided to score whiskies rather than just provide nice words as his pioneering scoring brought Johannes and me together across the 10,000 miles between Adelaide and Amsterdam. Michael was my silent and reliable guide for my first three years as a malt lover and made me comfortable with scoring whiskies. Thanks for the book and thanks for scoring whiskies. My very first steps in the world of malt whisky were taken with a copy of the “Malt Whisky Companion” in my hand. After being introduced to single malt whisky (Lagavulin 16 y.o.) by a friend of mine, Michael’s book was my first guide to the malt whisky distilleries of Scotland and their whiskies. Not long after my 'amazing discovery' of single malt whisky in the early 1990's I made another amazing discovery - Michael Jackson's Single Malt Whisky Companion. It was my very first book on whisky and it transformed my keen interest in single malts into a genuine passion. I doubt I would ever have found the courage to publish my musings on the world wide web if Michael's lyrical whisky writings hadn't given me the courage to do so. After launching the Malt Madness website I discovered many more whisky writers and good whisky books, but I still feel that Michael wrote 'the ultimate whisky book' with his Malt Whisky Companion - at least for me. Michael's scores also inspired some of the malt maniacs to start work on the matrix (and later the monitor). The first version of the matrix was nothing more that a comparison of the 'benchmark' scores of Michael Jackson and those of three or four maniacs. Unfortunately, I only met Michael a few times in real life. The last time I saw him was in May at the re-opening of the Kilbeggan distillery in Ireland. It was clear that he wasn't in perfect health, but he told me he enjoyed himself tremendously inside the old and unique distillery buildings. I guess that is what made Michael Jackson a 'guru' for many of the other malt maniacs as well - the passion for single malt whisky we shared. The first time I ever heard of Michael Jackson was around 1997-1998, I believe, and it was the origin of a misunderstanding which lasted quite a while for me… On an Italian newspaper I read an article about a local microbrewery which had recently started its business and which had immediately met with great critical acclaim (Baladin). At the time I was an avid beer drinker and I had never had a single malt except Glen Grant 5yo (of course), so this article caught my attention. The last lines of the article were very quite puzzling to me: they said that one of these beers was especially appreciated by Michael Jackson. How could that be? That a renowned pop-star, author of mediocre pop songs and known for his maniacally healthy diet, was a connoisseur of fine beers? That doubt remained with me for some years, although I tried that beer and yes, it was excellent. It was only several years later, that by chance I started getting interested into single malts. First a Talisker, then an Oban, then an Ardbeg… I was desperately looking for info on the Internet, but I was finding very little (I hadn't stumbled on Malt Maniacs yet). And then, that name again came to my eyes: Michael Jackson's tasting notes on Whisky Magazine. Some further research, and I blushed: it was not the (dis)coloured American pop star, but a guy with authoritative looks which reminded me a bit of the great Stanley Kubrick (another great loss of past years). And his words were authoritative too: interesting to read, compelling… not too many words, but very striking, often exotic, making my mouth water in anticipation… making me understand that there was much more to discover in the world of malts than I had initially thought of. And so I bought his Malt Whisky Companion, the last edition, and lost myself reading all those info I was craving for, dreaming of Scottish distilleries in remote places, getting acknowledged into new terms like “terroir”, “sherry cask”, “independent bottler” and discovering distillers I had not even remotely heard of. And so my quest for bottles began: sometimes I agreed with Michael Jackson's notes and scores, more often not (after all, we all have our tastes, don't we), but it was always an interesting reading. His book’'s pages were intriguing, a spur to go on and on tasting, experimenting, discovering. The tasting notes were so many and so fascinating that I was almost scared by the world that opened itself before my eyes. And so I have to thank Micheal for giving initial fuel and spark to my passion: without his book, it probably wouldn’t have been the same. I can't add anything that it hasn't been said on these pages.... Just a big "thank you" to Michael for his guidance introducing us to the world of malt whisky. His malt whisky books were real companions indeed! I´m sure he´ll be dramming from the angel´s share from now on! I only met Michael twice and in fact both times in the same week, after 20 + years of reading your books I was chuffed to at last shake your hand. We discussed the possibility of you visiting us in New Zealand, well I guess we will join you one day for a dram of the Angels Share which I am sure you will have notes. A whisky hero, who will be missed. THANK YOU FOR BEING A FRIEND !!!!!!! I took my first step thru the door into the world of Whisky in 1989. I came back from a trip to Scotland and realised I had to buy my dad a souveneer... On the boat home, I bought him a bottle of Cardhu Single Malt. When we cracked it open it was as if lightning struck. This was something else! Almost immediatly I went out to look for more of this strange drink called Single Malt.In the whole of Belgium there were no more than 6 or 7 different malts available (Bowmore, Auchentoshan, Glenfiddich, Glenlivet, Fettercairn, Edradour and Knockando). Once I had these, and found how different they were from each other, i decided to learn more about the subject and bought a book about whisky. It was the only one available. Michael Jackson's Whisky Companion... A virus had entered my mind. It would never let go again. Michael's tasting notes were like a magnet... So many aroma's, so many secrets waiting to be discovered! I had to try and find these "Rolls Royces" and "Premier grand Cru's"! I did, and Michael was my guide. He brought light into my darkness. To show his importance: Over the years I have amassed about 70 different books about whisky...10 of these are written by Michael Jackson... More than twice as much as any other whiskywriter in this "collection"! I have met Michael several times at various festivals since 1994, and he was always friendly, kind, witty and helpfull. His masterclasses were always exactly that: Master-classes! I will defenitely miss seeing him again! Like everyone else in the whisky (and beer) world, malts-L members were shocked and saddened to hear of the passing-away of Michael Jackson. For many, his Malt Whisky Companion was a companion in the true sense of the world when taking the first steps in whisky-dom. Malts-L felt that the best way to pay homage to the contribution that Michael made to the enjoyment of malt whisky was to raise a collective glass to the man. So which bottles were opened worldwide, which drams were raised in his honour? No surprise that the distillery which featured prominently among the raised drams was Macallan. 26 Macallans were poured, about half of all the toasts. And which Macallans where they? A 1946, a 1958, an 18 y.o. from 1968, from 1971 and (twice) from 1972, another 18 y.o. without vintage and of course 18 y.o. 'Gran Reservas' (1979 and 1980). Further OBs were a 7 y.o., twice a 10 y.o. 'Full Proof', a 12 y.o. 'Elegancia', two 25 y.o. 'Anniversary's, a 'Twenties', a 'Thirties', a '1874' and a '1851'. Indie bottlings included a 1968 – 34 y.o. from Murray McDavid, a 1980 – 20 y.o. Macallan-Glenlivet from Kingsbury's, a 1987 from Signatory, a 1989 from Dewar Rattray, a 21 y.o. from Scott's Selection and finally two Adelphi's: 16 y.o. and 30 y.o. Of course, plenty of Islays! An Ardbeg Mor ("a huge bottle for a huge man", an Ardbeg 1975, an Ardbeg 1978 ("plus Thomas Hardy Ale 1996") and an Ardbeg Uigeadail. Two Bowmores: a 1972 from Signatory and a 33 y.o. from Duncan Taylor. Also two Laphroaigs: a 10 y.o. 'Green Stripe' and a 'Quarter Cask'. Finally a Caol Ila 1966 – 36 y.o. and, of course, a Lagavulin 16 y.o. More island toasts in the form of a Talisker '175th Anniversary' and an Isle of Jura 10 y.o. Campbeltown whiskies were represented by a 15 y.o. Springbank and a 11 y.o. Longrow from Cadenhead. There was a 1982 – 24 y.o. Brora from Gordon & MacPhail to keep up the peat levels. And then a smattering of other malt whiskies: a 30 y.o. Glenmorangie, a 1988 – 10 y.o. Linkwood from Wilson & Morgan, a 1976 Strathisla from Samaroli, a 14 y.o. Mannochmore from Cadenhead, a 1972 Glenlivet and a 21 y.o. Glenlivet ("plus a glass of a great Belgian beer to wash it down"). And a 1992 Bladnoch from Signatory. A couple of other whiskies: a Power's Pure Pot Still, distilled in the 1960s, a Highland Queen, bottled in 1964 and a 5 y.o. White Heather. Michael, we hope you got a bit of a nose from this global glass raised to you. We won't begrudge the angles their share as much anymore now. Thank you for all you have done; rest in peace. I have knowm Michael for many years, and it is with deep sadness to hear he has passed away . Michael travelled to South Africa in 2004 for whisky live, it would be the second time I would meet him. The first being in 1994 in a rather trendy Club in London I think he was promoting his Cocktail Book. He was a giver that is what I remember most, regardsless of how many times he was asked the same question he remained enthused and informative in his response. Eventually he sat down to a beer and we joined him after 2 really great hours of sharing we had to leave for a previous engagement. His sense of humour and passion for life were evident in abundance and his knowledge of all things malt and jazz were mesmerising. We will miss you, you are a legend and will thankfully through your work live on. The angels will have to account for their share and hopefully have been keeping notes as a great whisky man has entered the still house in the sky. Will be sorely missed by all who love the greatest spirit in the world. Your passion had passed on to me, as well as to so many other afficionados all over the world. We owe you so much Michael ! The news of your passing leaves us in a very sad mood, but don't worry : your contribution to the world of whisky lovers is so great that you'll never be forgotten. All of us, your followers, will keep you in mind and heart as long as we live. Now you've joined the angels and I only wish you your rightful share of the spirit we love so much, thanks to your work. As many fellow whisky lovers on these pages, I started my discovery in the companion of Michaels books. His books guided me in my period of unknowingness. Every word in the books learned me something new and gave insight in the wonderful world of flavor and odor. My personnel whisky library contains not only whisky books of Michael’s hand, but also a lot of books about beer. This man has been the guide for so many people around the world that he actually should receive a statue in his Honor. On August 30, 2007 the beer and whisky world lost its largest icon. Michael Jackson died in his house in London, at the age of 65. The man who shared his name with a celebrity in show-bizz, once said about that coincidence: "I am the one who doesn't dance, sing or drink coca cola." Instead he taught hundreds of thousands of people all over the world how to enjoy their dram. Without any exaggeration, since Michael's Malt Whisky Companion sold more than 800,000 copies. Michael was ill, suffering from Parkinson's disease, and he knew it. Roughly a year ago we discussed this rather sensitive topic and I advised him to start writing about it, so that people would understand. Gradually he started doing so and we were thankful for it since many people often mistook the Parkinson symptoms for his being drunk, which Michael hardly ever was. "At school I excelled in English. Latin wasn't too difficult either, but the rest was crap. That's why I decided to become a Great Writer, so I looked for a similarity among successful authors and quickly found one: "Booze!" My English teacher at high school let me listen to a recording of Dylan. I mean Dylan Thomas, the English poet and writer of short stories, whose name would later be used by Bob Dylan as his artist's name. His works are extraordinarily good, but so were his drinking habits. In 1953 he died in New York after having downed no less than 18 glasses of whisky. What an example. When I reached the age of 16 I left high school to work at a local newspaper in Yorkshire and was already used to drinking reasonable quantities of beer. When I turned 18 I moved to Edinburgh having been offered a job at a Scottish daily newspaper. One of my new colleagues was Willy McGuid. Many, many hours I spent with him in the pubs in Edinburgh, but he always complained about my drinking habits. When I asked him which type of beer I should drink according to him, he shook his head and explained that it wasn't the beer, but the nips in between. "I don't like whisky" I reacted to Willy. Where I got that nonsense from, I still don't know. For a Scot who has just been insulted about his national drink, Willy stayed very quiet. He tried to explain to me what a single malt was and offered me a Glen Grant. I instantly revised my opinion. It was the starting point of my lifelong journey along the beers and whiskies of the world." That's what Michael answered me, years ago, when we first met in the Craigellachie Hotel in Scotland, and I asked him why he had become a writer. It's Michael to a T. He never answered with words, but always with stories. As so many whisky lovers I grew up with his books, specifically The World Guide to Beer (1977), The World Guide to Whisky (1987) and The Malt Whisky Companion (1989). When I started my own whisky quest in 1974 I could not even dream that I would translate the fifth edition of the Malt Whisky Companion into Dutch nearly 30 years later. During that process my mentor for years became my best friend in the whisky world. We contacted each other a lot, everywhere in the world. And we had fun, lots of fun. Sometimes we would help each other out with difficult deadlines. "Hans, can you write a short article about you-know-what for that German magazine we talked about some time ago?" One or two days later it was in his email box and he only had to edit it and send it to the publisher. "Michael, I dearly need a couple of tasting notes on those new single malts, but I haven't tasted them myself yet." They would appear in my mailbox shortly thereafter so that I could publish Michael's findings the next day. By the way, deadlines weren't exactly Michael's forte. A couple of months ago Becky and I were in London to brief him on our new book A Taste of Whisky, for which he agreed to write the foreword. "Meet me at 4 pm in my office", he said over the phone. When we arrived spot on, he was still typing away on his I-book, but immediately stopped and said: "Let's go out, let's have some fun. To the pub." And hop we went. About 45 minutes later Michael's cell phone rang. "It's Glenfiddich, they need the tasting notes on their soon-to-be-released 40-year old". Michael whispered, covering the phone with one hand, while removing a sample bottle out of his pocket with the other one. "You'll have it tomorrow", he ended the call. "I should have sent them the note three weeks ago". His hand went into his pocket again and returned with a tasting glass. Together we wrote a tasting note. It would be the last thing we wrote together. Last week Michael emailed me the foreword, about one-and-a-half months past the deadline. An hour later he was on the phone and wanted to know whether I liked it. "A bit late, but very beautiful. Thank you." He laughed and told me he was on new medication and felt slightly better. "Five more years, that should be possible, Hans." It turned out to be five days. The Grand Old Man of Whisky is no more. His death leaves a void for many, many people. Becky and I lost a very dear friend. 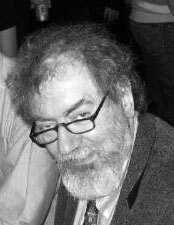 A friend who, above all, was a fellow writer, with whom I could share so many things, also outside the whisky world. "I prefer to be called a whisky writer instead of an expert. Although most distilleries consult me as an expert, first and foremost I am a writer." Another quote of his, one that keeps lingering in my mind. To me it would be the perfect epitaph for Michael. Although he will not witness the launch of A Taste of Whisky at the end of September, Michael will be there in the spirit and we'll drink to him, albeit it with a taste of sadness. Rest in peace, dear friend. We will miss you every day. Michael’s “Malt Whisky Companion” was for me, as for many, the first true source of information about the nectar I dearly love. As a Belgian I will also miss him as ‘the’ spokesman for our national pride: beer. Michael’s “The great beers of Belgium” is in my opinion a real passionate work about a subject he loved and enjoyed. In november we’ve planned a Speyside themed clubtasting including a Macallan 18 from 1967 which he particulary enjoyed. All clubmembers will raise their glasses to his memory. Michael, may you be the first angel to take your share. Listening to Michael speak would lead you to believe that writing was an effortless pass-time to him but in reality I know that despite both his natural flair and professional abilities he agonised to encapsulate and bring alive the people, the places and the products we have come to know so much better through his books and articles. He was a perfectionist. I think we have been very fortunate that such a special writer's talents landed, as a butterfly might, upon our beer and whisky flowers. Michael could have written majestically about a great number of subjects and all would have been far richer for his observations and miraculously elegant style. Michael brought an understanding of Malt Whisky to the people. His sense of fun, scholarly writings and his anecdotes sprinkled with classic wit remain, for many of us, in fond, vivid, memory and for others, in text, as testament to his passion for and knowledge of this subject. He loved, mischievously, poking fun at marketing nonsense but encouraged real thinking and understanding from tasting, more than any other of his time. We all in the Industry has so much to thank Michael for. In his modest way he taught us to value and really appreciate Scotch Whisky and, especially, Single Malts. I never had the pleasure or privledge of meeting Michael in person, but his book, or should I say the bible of malt whisky is one of the things that inspired me and spurred my interest even more. It is in part due to the The Malt Whisky Companion that I continue to explore new malts. In truth I use it to compare,to argue or even just to brush up on my limited knowledge.I am sure there are countless Malt Whisky lovers the world over that owe so much to this man and feel the way I do. I'm sad, to lose a malt companion. I've never met him but it's was a pleasure for me to see every wrinting he had done. Michael Jackson died, and I am taken aback by how sad I am. I suppose he was a constant companion of sorts; I've known him via his books since 1989, that's a long time for someone with such a disjointed existence. Anyways, I'll raise a glass in his honor tonight. Michael Jackson is the one who put single malts on the map; he is truly a pioneer. People in the industry all owe a debt of gratitude that most cannot begin to conceive of. The best way to start your adventure in SMSW is buying some bottles, opening them and trying them (in good company), comparing them. Then you’ll buy some more, but you’ll feel lost in the whisky jungle.You need a guide. Even though many times copied, Michael’s companion is the best way to find your way. You’re better off buying this book, than an eleventh bottle (which will be bought soon after).Some years later, when you have bought a lot of books, (and a lot of bottles), you’ll find out, that every book Michael published is an unique piece of work, filled with love for the subject, the people who make it and the land it comes from. Just have a look. Now Michael has left the warehouse. Bugger ! Every time it’s unbelievable. Here today, gone tomorrow. I hate that. We all lost a great man. I regret not having met him, but I’m happy to have read him. I regret I will never have the chance, on this earth at least, to ask him, why he rated the rare malts St. Magdalene 19yo so low… Thanks Michael, for all you gave us and teached us. Thanks for the genuinity (yes it’s really a word) of your work. What would your next book have been? Earlier today I raised my glass to Michael (several times actually). I wondered what should I take. Open something special, something rare? Instead I first chose the greatest all-rounder in the world and after that one of his beloved Macallans (cask strength, I needed that !). My thoughts go out to his relatives and best friends. How sad it is I lost the man you open me the world of Whisky, I never met him but his Book "The Malt Whisky Companion" was a fantastic friend and teacher who greatly improved end expanded my whisky horizon. So it's with a tremendous sadness that I learn his death. Now His book will be even more important. It was with sadness I recieved the news about Michael Jackson had passed away. He was for many years a good friend. First when I was in the Master of Malt final and he was one of the judges, later when he traveled to Highland Park with me to spend a couple of days......some days we had. Later again as The writer visiting Craigellachie Hotel and The Quaich Bar. I was there as whisky manager and Michael always entertained people when he was there......Latest i met him again in my work as Brand Ambassador for Edrington Group, he was happy for me who reached my goals with whisky.....and thanks to him, I did. It is a real shock to learn that suddenly Michael is no more with us. This is so sad and so difficult to admit. I will in particular always remember the first time I met him, on a boat on the river Seine in Paris when Martine Nouet introduced me to him, quite a few years ago already. I was so surprised by how affable and accessible the whisky "Guru" was, and could I talk with him at length, spending a most enjoyable and interesting moment in his company. His "Malt Whisky Companion" has always been an invaluable source of reference and a reliable guide since my very first steps into the world of whisky. Michael was not only the whisky "Guru" everyone knows, he was also the nicest person you could imagine and a genuine poet. It is very painfull to learn that Mike passed away, he was the man that gave me the inspiration for Wilson & Morgan after I read his first book more than fifteen years ago. I invited some friends whisky lovers to share the precious gift of his visit to me. We spoke a little about whisky, we spoke about life, music, and wine. This is sad news indeed. I met Michael on the first day of 2005 Speyside Whisky festival. We were the only two at the Quaich bar in the Craigellachie Hotel at the time and he and I chatted for about 30 minutes about my favorite malts. The thing that struck me at the time was his interest in the things that I liked about the malt. He wanted to know the intricacies of the things that I tasted. What i thought the "mouth feel" was. What other malts I like. That sort of thing. He was more interested in my opinion rathar than telling me what I should like.